The regular season is in the books and players are now looking ahead to the mass of bowl games on the horizon, along with the College Football Playoff. With a bit of a lull taking place between now and the start of the playoff, it seems like the best time to deliver my list for Studs and Duds of the year. Many might deem it more appropriate to create this list after the postseason is concluded, but many top-tier players will be forgoing bowl season to prepare for their future NFL careers. Here are the top five studs and duds of the 2018 college football season and all of its chaos. Imagine this, your typical Nick Saban Alabama team with dominant defense and elite wide receivers all over the map, but this time add a top-tier quarterback who can stretch the field. Tua Tagovailoa was arguably not only the best quarterback, but the best player of the 2018 College Football season. Nick Saban has never been a fan of building teams that rely on one person, and while this team would likely still be in the playoff without him, they wouldn’t have been able to string together the greatest regular season in history. He racked up over 3,000 yards and 37 touchdown passes while only throwing four interceptions. It isn’t easy to put up numbers like that in the SEC. His stats would have been even flashier if he wasn’t sitting on the bench for almost every second half due to all the blowouts his team engineered. To say the PAC-12 had a down year would be putting it very nicely. The conference didn’t have a single College Football Playoff threat and most of its usual contenders completely fell off the map. The conference champion Washington Huskies will be playing in the Rose Bowl and Washington State enjoyed a breakout season, but that’s about it. Oregon, USC, and Stanford were all supposed to be playoff threats, but none of them panned out. The Ducks and Cardinals weren’t ranked by the season’s end and will be playing in smaller Bowl Games. The Trojans couldn’t even manage a winning record. The bottom of the conference had arguably the three worst teams in college football: UCLA, Oregon State, and Colorado. No one expected much from the Beavers and Bruins, but what happened to the Buffaloes? Ohio State’s star quarterback may not have won the Heisman, but it’s hard to argue against those claiming he had the best body of work. Haskins only lost one game against an admittedly terrible Purdue team, but that loss was hardly his fault as he threw for 470 yards. He totaled 4,580 passing yards (most in the FBS), 47 touchdowns, and only eight interceptions during the regular season. He isn’t known as a runner, but he also had 122 yards and four touchdowns on the ground. He also beat and piled incredible stats on much tougher defenses than the other top two Heisman candidates. It’s hard to overlook 396 yards and six touchdowns against Michigan, the top defense in the nation. It was just a season ago that the Seminoles were ranked third in the nation and opening up against the number one ranked Crimson Tide, but that already feels like the distant past. A 5-7 record with their only big win against a banged-up Boston College team isn’t a great look. They had a brutal schedule, but this is not the annual title contender we once knew. Hard times have fallen upon the Florida State football program, and the future isn’t very bright. 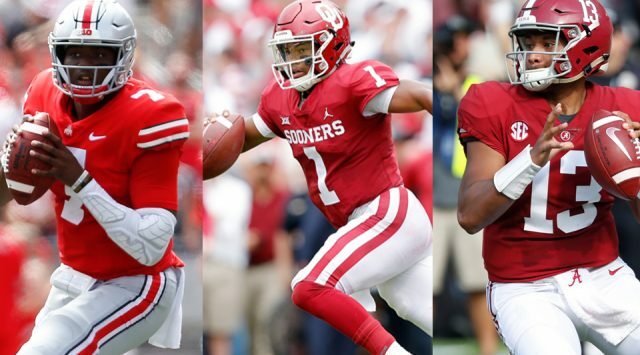 Kyler Murray might be on his way to a successful career in Major League Baseball, but he still managed to claim the highest honor in college football. The 2018 Heisman winner put a suspect Oklahoma team on his back and carried them all the way to the College Football Playoff. He now faces his toughest challenge of the year with the Alabama Crimson Tide defense lurking on the horizon. He accumulated 4,945 total yards en route to scoring a whopping 51 total touchdowns. Say what you will about the weakness of Big 12 defenses, but these numbers rival that of Baker Mayfield last season. Murray may have been drafted by the Oakland A’s of the MLB, but he will still be getting considerable attention from the NFL. It was not a great season for parity as each of the power five conferences this year were all rather lopsided. There weren’t only five good teams, but there was only one good division in each conference. This resulted in some rather lopsided conference championship games come seasons end. The Big 12 and SEC were the only exceptions to this trend, Georgia vs. Alabama was a thriller and the Big 12 doesn’t have divisions. The Big 10 East was its usual bloodbath as the Ohio State Buckeyes, Michigan Wolverines, Penn State Nittany Lions, and Michigan State Spartans beat up on each other but the West was won by … a four-loss Northwestern team. Wisconsin and Iowa were major disappointments, Purdue couldn’t figure it out, and the less said about Nebraska the better. A terrible Pitt team somehow won the ACC Coastal only to be blown out by Clemson. The PAC-12 championship was played by Utah and Washington teams that each had three losses. There is a lot to like about the 2018 Clemson Tigers, but their strongest unit is without question their defensive line. The Tigers front four shut down opposing run games and sacked quarterbacks at a ridiculous pace, but no one did it better than Christian Wilkins. His line of 4.5 sacks and 12.5 tackles for a loss don’t jump out on the stat sheet, but that doesn’t account for just how many plays he has blown up as the year has gone on. So much for that revenge tour. Jim Harbaugh hyped up this season as a redemption campaign, but it ended with the exact same result as every season … a blowout loss to Ohio State. The Wolverines were favorites to reach the College Football Playoffs pretty much all year long, but once again fell short. They shut down rivals Michigan State and Penn State and cruised past several other Big 10 opponents, but were unable to get past Urban Meyer and the Buckeyes in a loss that ultimately defines their season once again. Neither Kentucky or Texas will be playing for a National Title, but both teams enjoyed breakout seasons and returned to relevancy for the first time in quite awhile. Kentucky was hanging around in SEC contention until a late-season loss to Georgia and will have a high profile bowl matchup against Penn State. The Longhorns returned to the Big 12 title game and rallied off several big wins as the season went on. Not much to say here other than Auburn didn’t get it done in 2018. After a breakout year in 2018 and a big win over Alabama, the Tigers fell back to irrelevancy in the 2018 season.